Wage theft occurs when employers do not follow the state labor laws. Examples of wage theft include paying less than minimum wage, not paying workers overtime, not allowing workers to take meal and rest breaks, or taking tips from workers. Anyone working in California can file a wage claim, even if you are paid under the table in cash or do not have papers to work. Labor laws protect all workers, regardless of immigration status. If I do not have papers to work can I file a claim or report? Yes. You are protected by labor laws whether or not you have papers. If you call the Labor Commissioner's Office to report a problem, they will not ask you about your immigration status. It is against the law for your employer to threaten you because you don't have papers. Do I need a social security number or photo identification to file a claim or report? Do I need a lawyer to file a claim or report? Can I file a claim or report if I do not speak English? Yes, the Labor Commissioner will provide an interpreter in your language. Be sure to request an interpreter when you file. You may call or go in person to the Labor Commissioner's office in your area to file a wage claim or a report of labor law violation. How much is minimum wage in California? There are a few specific exceptions to minimum wage law that exempts outside salespersons, individuals who are the parent, spouse, or child of the employer, and certain apprentices. Additional information on minimum wage laws is available on the Labor Commissioner's website. Should I receive overtime pay? Double the regular rate of pay for all hours worked over 12 hours in a workday. Double the regular rate of pay for all hours worked over 8 hours on the seventh day. However, overtime laws do not apply to all workers and certain workers, such as domestic workers and farm workers, are covered by different overtime laws. Additional details on overtime laws can be found on the Labor Commissioner's website. Does my employer need to give me a meal break? Most workers in California must receive an uninterrupted 30-minute unpaid meal period for every five hours worked. Certain workers such as domestic work and farm workers are covered by different meal and rest break laws. More information on meal periods can be found on the Labor Commissioner's website. Does my employer need to give me a rest break? Most workers in California must receive a paid 10-minute rest period for every four hours worked. You may be entitled to a rest break even if you work less than 4 hours. Certain workers such as domestic work and farm workers are covered by different rest break laws. For more information on rest periods visit the Labor Commissioner's website. What if my boss fires or punishes me for reporting a problem? If your boss fires, demotes or punishes you for reporting a labor law violation or workplace safety hazard, this may be a form of retaliation. 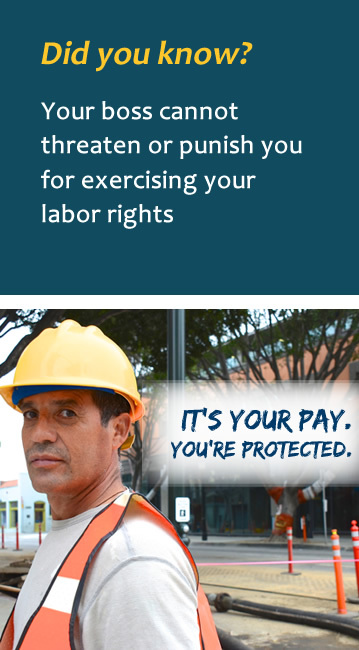 California law prohibits employers from retaliating against workers for enforcing workplace rights. If your employer retaliates against you, you can file a complaint for retaliation.